Deanfield Homes, a new developer that is active in Oxfordshire, Buckinghamshire and Hertfordshire, has joined up with Classic Folios to offer an A5 Quick Reference Booklet and the Hoozzi online portal for their first developments. Being entrusted with the handover solution for a developer’s first residential project is a great display of confidence in Classic Folios’ service and provides an excellent opportunity for us to use our industry experience to advise what works well in various contexts. Upon sharing Hoozzi with Deanfield Homes, it was decided that this product was the best fit for their needs, with the flexibility it affords users with mobile access, multiple users and consolidation of information in a single location, all well-suited to their small to medium sized developments of 2, 3 and 4 bedroom houses. Residents will have access to the portal from Reservation, providing them with access to key information and contacts that will help streamline the process, while also reinforcing the Deanfield Homes brand. At the Completion stage, the portal will be updated with information tailored to their home, such as fixtures and finishes, as well as direct links to registering warranties with appliance manufacturers. The addition of an A5 Quick Reference Booklet to this package allows Deanfield Homes to present buyers with a physical product at handover – a gesture that cannot be overstated in its importance to brand promotion. This booklet, a condensed version of the plot-specific Completion Manual that will be present on Hoozzi, will contain details of each home’s systems, suppliers and key contacts, providing an easy point of reference for queries that are likely to arise shortly after the buyer moves in. When starting out as a new developer it’s important to have the right tools in place to support a small team whilst building a strong and quality brand. 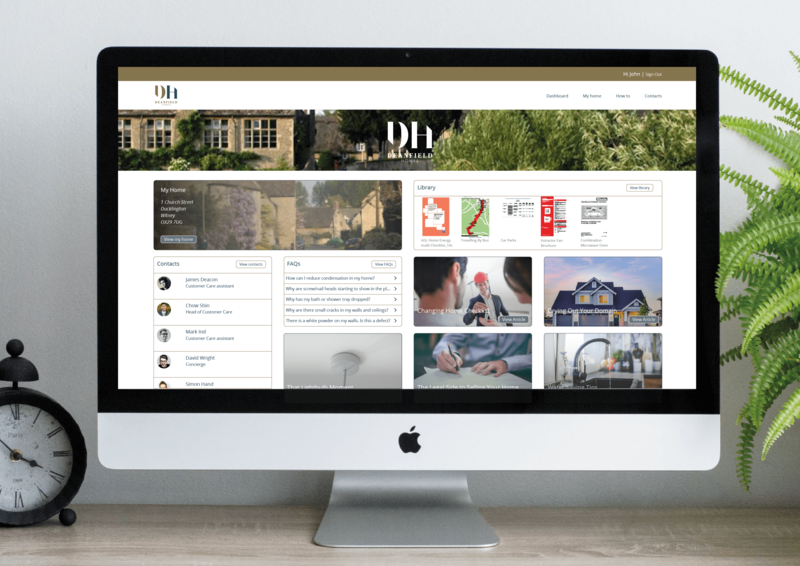 Deanfield are offering their buyers all of the information they need via our digital portal so buyers feel supported from the day they reserve their plot. Seeing the progress of their build via photo and video uploads will enhance the countdown to move in day. For those not internet ready on move in day, the Quick Reference Guide has all the headline information they may need thus preventing the need for lengthy customer care queries.